By Mangia Memoirs on July 25, 2011 in OOPS! Sometimes the pros DON’T know best. Ya just gotta make a recipe your own–and that is half the fun! 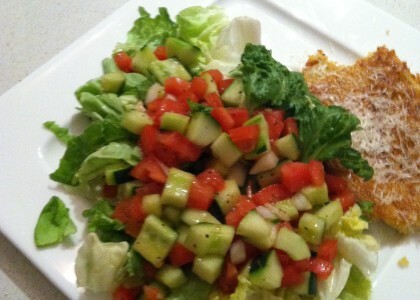 The Meal: Chick Pea Pizza alla David Rocco, Mediterranean salad with chopped cucumber, tomato, hearts of romaine & lemon. The Details: chick pea pizza, aka “la cecina”, is allegedly a very common dish in Italy. It is made from chick pea flour, a naturally gluten-free flour, olive oil, salt & pepper. FALSE ADVERTISING: The recipe he shared on the TV program didn’t match the details found in the actual recipe on the website. Not really a big deal, unless you weren’t planning to look up the recipe online….which we weren’t. I mean, how hard could it be? What he showed us on the tele was a piece of cake (well, pie). We were curious about the portion size, so ended up looking at the recipe and learned a key STEP that was missing from the TV program. The chick pea batter has to sit for nearly an hour before placed into the oven. We definitely weren’t expecting that. FLAVORLESS: The recipe could use a little SEASONING LOVE. Be sure to the follow the recipe and then toss in your favorite seasonings like rosemary or thyme. Whatever you like. And definitely, a little more salt. COOL DOWN: if you try to take the pizza out of the pan immediately (like we did), you are going to end up with flaky broken mess. Let is rest for about 15 minutes or so. It will regain some of it’s form and elasticity, making it easier to slide out of the pain and cut into the shape you like.